I dipped my big toe into Heaven today by attending the Chrism Mass this morning at our Cathedral! Last year a friend and I went, because it was something on my "bucket list". We decided last year that it might have to be an annual event for us, but in actuality, it was yesterday evening before we finalized plans. With the issues in my household lately, lets just say I wanted to avoid drama. We got there well in advance of the start of Mass - mostly because of the parking - and we found seats right around the vicinity of last year's. Most of the seating in the Cathedral is reserved, so it is good to get there early! In our section were a lot of young families and middle aged + women. Last year, I was struck by the diversity of the priesthood. 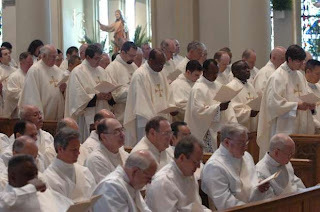 The vast majority of those in the diocese are present, and there are short, tall, young, old, black, white, Asian, long haired, short haired, and bald ... After the homily,as seen here, they renew they renew their Priestly Promises. Credit for all these beautiful pictures goes to P.C. Piazza. I hope he does not mind me sharing them. This year, though, I was struck by the richness of our faith. The sensuality of it. 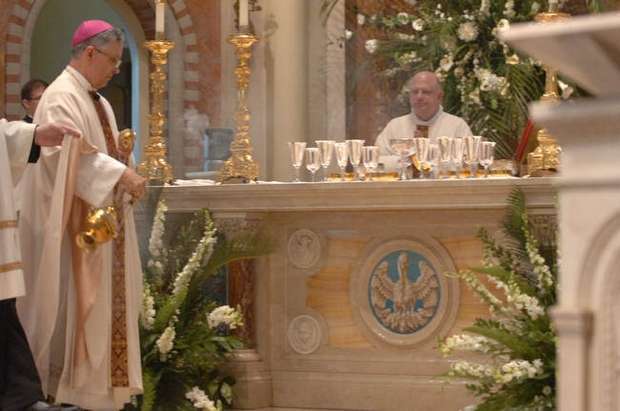 A faith that is so vibrant we can see it, hear it, touch it, taste it, smell it. Not that any of those things stand in the place of faith, but they are a way to represent what is so abstract and so hard to define. A human way to represent the divine, maybe. We listen to the Word while sitting in beautiful surroundings. Eyes and ears. Touch is so important. 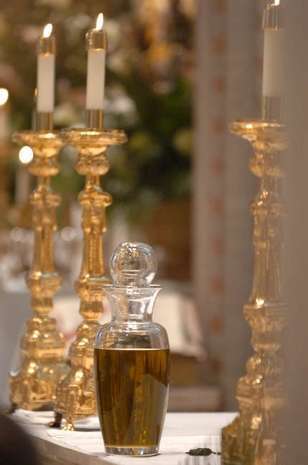 The oils that were blessed all necessitate the human touch. 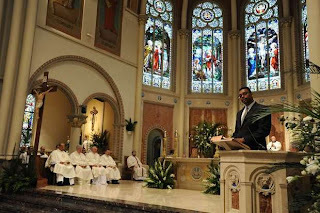 (That's my dentist, a deacon, carrying the oil.) 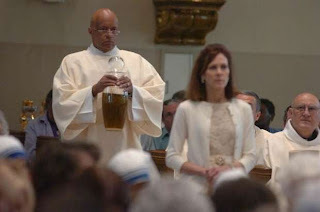 That's part of the Chrism Mass - blessing all of the oil that is used in the diocese in the coming year...it is then presented during the Holy Thursday Mass at each parish later in the evening. A faith that we can smell. 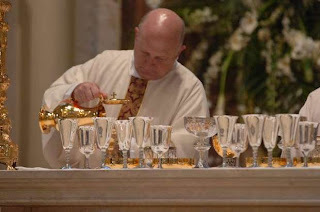 Here the Bishop inhales the sweet fragrance of the Chrism after mixing perfume with the oil. And the incense. The wonderful smell - symbolizing our prayers rising Heavenward. I hoped a few times that there were no smoke detectors in the place! Even taste is not left out. The Lord Jesus, present under the appearance of bread and wine. 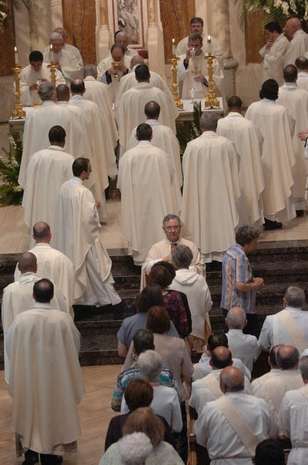 Last year, I was amazed when, of all the priests in the Cathedral, I received the Eucharist from my pastor. I remember thinking that it was a nice, divine touch of personalization. Today as we left, my friend asked, "Did you just receive Communion from your priest and your dentist?" What were the odds? But that's how it worked out. We were led by an usher to a spot in the backnof church where the Eucharist was being distributed. There was my pastor distributing the Host and my dentist - the deacon - there with the Precious Blood. 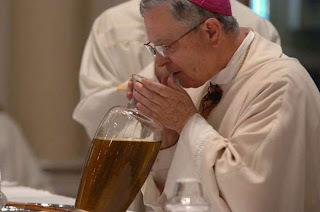 The Chrism Mass very much celebrates the Institution of the Priesthood, which also occurred on the First Holy Thursday. Those who were sent to bring glad tidings to the lowly, heal the brokenhearted (Is 61), to proclaim liberty to captives and bring sight to the blind (Luke 4) Two of my favorite priests are in the above picture. 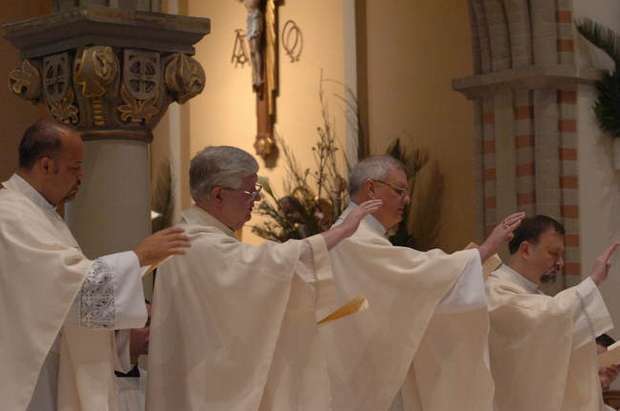 The priest second from the left, I met when I was a college freshman. He was at the Catholic Student Center back in the early 80's. In the 90's, he was once again my pastor at a different parish and officiated at our wedding. In the 00's, he was the one I sought out to hear my confession after too long away. And second from the right, is my current pastor...wise, humble, holy. They give God a human face in today's world. 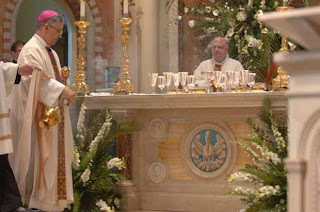 I'll leave you with a couple of more pictures...the priests receiving Communion...because I always wondered how that was done...they all approach the altar and "self-communicate"..
okay, I have now added the chrism mass to my bucket list for next year! Happy Easter!